Philips is really getting into kooky lighting these days, and its LivingColors Lighting System it showed at its Simplicity event a few months ago takes all those hippie lights to the next level. Its palm-sized remote control has a color wheel that operates similar to the clickwheel on an iPod, where you move your finger in a circular motion to change the color of the light, and then you dim it with a rocker switch in the middle. We're just scratching their heads wondering why you'd want all that colored light anyway. Can't the same thing be done with an old-fashioned Christmas tree color wheel? Maybe you've figured out some kind of scheme that's supposed to aid your sleep, such as the $2300 NightCove Sleeping Solution. 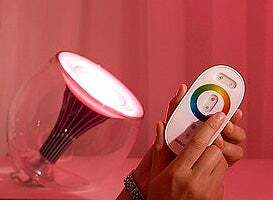 Anyway, the LivingColors lighting system is a concept that Philips vows to bring to market sometime soon. Jump for an impressive video of the system in action that we hadn't seen before. Eh, looks like it would be fun to play with, but who wants to be bathed in odd-colored light all the time?